Anyone got any matchsticks? Lots of them? I’ll get back to that in a moment. 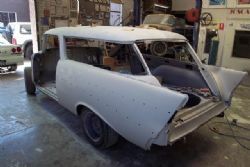 The Nomad has lost its purple blue paint and is looking rather resplendent in its birthday suit grey. After being stripped down to the barest body shell and then being blasted to remove the sins of prior owners over the last fifty plus years it looks very calm and lonely sitting in the middle of the workshop floor at Joscar Smash Repairs in Revesby, Sydney. After doing a mountain of research on the various blasting techniques companies use and speaking to a few proprietors we had the choice of sand/garnet blasting, media blasting using tiny plastic beads and soda blasting. All of the methods have their pros and cons and the initial decision came down in favour of soda blasting. This choice was made mainly on the basis that this method does not harm the underlying metal in any way, is environmentally friendly and results in a clean smooth finish. That’s the theory anyway. Unlike the other forms of paint removal it cannot be reused – they literally blast the paint off the car with dry, powdery soda. This is the perfect media to use if you wanted to strip the paint off a new car or one that had no prior damage or rust. The downside of soda blasting is it does not remove rust or body filler. 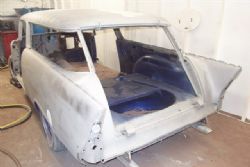 The next choice was who to trust with Project Nomad to remove the paint. In Bankstown there is a company called Quik Strip who specialise in soda and abrasive blasting. 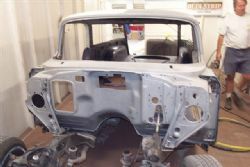 The company is owned and operated by Greg Morris who is a classic car enthusiast and was born out of his dissatisfaction with paint removal jobs performed on his cars. He understands the various stripping methods and treats each job as if he was stripping his own pride and joy. Project Nomad was off to Bankstown. As I suspected the Nomad had its share of body filler and its share of rust. Greg was in touch with the body shop on several occasions based on what he had found and had them come over and look at various sections of body filler and discuss the best removal method. The soda blasting highlighted these areas so after about twenty percent of the paint was removed an executive decision was made to go the full hog and get the garnet blaster out and give the poor old girl what she needed. Garnet blasting removes everything, literally. Rust, bog, road grime, you name it, it’s gone. A bull in a china shop approach is not recommended. The difference between a great job and something that is going to leave both the owner and body shop unhappy with is the time and patience spent removing the paint. A fine grain garnet applied at low pressure minimises substrate damage and results in a dulled greyish finish on the panels. Everyone was happy with the final outcome. Now, about those matchsticks....What was discovered beneath the paint and bog was about a hundred and fifty tiny holes the size of a matchstick head. A couple of the other panels were not so fortunate. The lower rear of the front fenders, the floor, inner and outer rocker panels and the trunk splash panel are beyond redemption and once cut out will end their life as landfill. The matchstick sized holes can be competently dealt with by the team at Joscar and overall it was about what I expected. The good news came with regards to the roof. Due to the ribbing on the back half it is tedious (read very expensive) to fix and no one does replacement sheet metal. The roof had about three pin holes in one corner and had been slightly skimmed in bog in a couple of places to make it smooth. It still sported a few dents here and there but with a little coercion and attention will be good as gold in the future. One of the rear quarters had a small patch of deep bog plastered to it. It looks like at some point it received a hit from something that was not road related – it may have been someone on a push bike banged into it in the driveway or it could have suffered one of those in garage incidents where something fell on it. Whatever, Bubba decided to give it a couple bangs with a pointy hammer and then deposit half a large tin of bog on top to make it look as smooth as a mud pie. Thankfully this was the only fixed exterior panel Bubba had a go at but it looks like his handy work also extended to the bonnet. I’ve documented the floor in the past and with a little paint stripped off it there was no point pushing on as it was a shot duck, no thanks to Bubba or the rust. The replacement sheet metal list consists of two lower front fender patch panels, a full floor pan, rear trunk splash panel and new rocker panels. Not too bad. I thought the lower quarters and the pillar supporting the roof behind the front door may be shot but they were all surprisingly good. Same can be said for the tailgate which normally doesn’t age well. 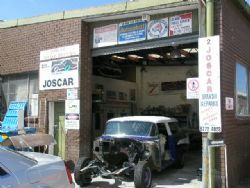 The doors are yet to be stripped and I know they are carrying their share of bog but the guys at Joscar have fixed heaps of them in the past so I am not losing sleep over them.